Two huge Premier League derbies take place on Saturday as Liverpool play Everton at Anfield and Arsenal take on Tottenham at Emirates Stadium. The tradition and history of those fixtures is well known, as are other great rivalries such as the Old Firm derby in Glasgow between Celtic and Rangers, and Spain's El Clasico - Real Madrid against Barcelona. But what about derbies elsewhere? 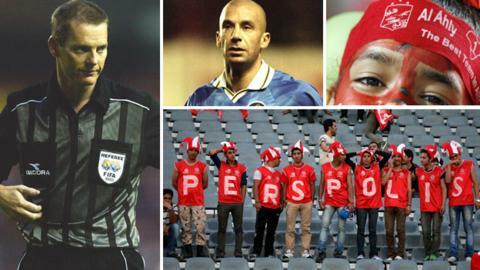 BBC Sport uncovers tales of incognito referees in Egypt, an Irish hero in Iran, a 'Rambo-like' spy in Italy and fan 'curfews' in India, amid great fixtures around the world with which you may not be so familiar. Of all the games to referee, a derby between two fierce rivals must be up there as one of the toughest. But while the officials for Saturday's Premier League derbies might find themselves the subject of chants or boos from the fans, they will probably not need to be flown in under the cover of darkness prior to the fixture. That, though, was the case for Scottish referee Kenny Clark, when he took charge of Africa's biggest - and arguably the continent's most hotly contested - derby back in 2001. The Cairo showdown between Egyptian sides Al Ahly and Zamalek - the country's two most successful clubs - is so fierce that local officials are not entrusted with the fixture, with foreign referees instead brought in. When Clark - at that stage a veteran of four Old Firm games - answered the Egyptian Football Association's call 13 years ago, he did so after several other European officials had refused to make a referee available. "In the previous year, the French referee had abandoned the game after about 10 minutes because of crowd trouble, so we knew what we were going into," Clark told BBC Sport. "Ordinarily when we travel abroad we are suited and booted in our Scottish FA blazers, but we were told to travel incognito because we would have just got hassled from the moment we arrived at the airport otherwise. "But even though we had travelled in casual clothes, there were people who recognised the guys from the Egyptian FA that had met up with us - they sussed we were officials and from the moment we were clear of customs, we had people shouting at us about helping Zamalek or Al Ahly." Clark and his fellow officials were assigned a bodyguard he felt was "capable of killing someone with his bare hands", who stuck with them throughout their time in Cairo. But, as strange as the experience was on their arrival at the airport, it got even stranger when they turned up at the 70,000-capacity Cairo national stadium for the game. "We arrived 90 minutes before kick-off and it was incredibly quiet. The fans were already inside - 70,000 people already inside and waiting," added Clark. "We went to perform our usual pre-match pitch inspection. We had been at one goalmouth and went down to the other, and one of the linesmen decided to take some photos with fans in the backdrop. "Our bodyguard then told us we would have to take photos at the other goal, because the other fans would have noticed we hadn't taken a photo with them in. "So, in the interest of balance, we had to go back to the other goal and take photos there, but after we had done that we were told to go back to the other goal because we had only been there once and, again, the fans would notice." The game itself passed by largely without incident until the final 10 minutes, when bottles and bricks were thrown on to the pitch, prompting Clark to tell his linesmen not to go near the corner flags. "I said go as far as the 18-yard box for offsides but don't go any further - if you get an offside wrong, you get it wrong; it is not worth getting a rock on the head for," added Clark. "We managed to get the riot police to move the fans further up the terracing and we were able to finish the game." In the end, Zamalek took the derby honours, beating Al Ahly 2-1. So important is the city derby between Esteghlal and Persepolis in Tehran, the capital of Iran, that businesses close down on the day of the game. "Everybody, everywhere is waiting to watch the game - not just football fans," former Iran defender Mohammad Taghavi, a veteran of nine derbies who played for both teams, told BBC Sport. "Our derby is very important to the people of Tehran and it is quite different to the derbies in England. People accept the result in the Premier League but in my country, when you lose a derby, everything changes. "A whole season can depend on the derby. You might finish fifth or sixth, but if you win the derby, it can be more important than winning the league." Arguably the biggest derby in Asia, the Tehran derby regularly attracts crowds of 100,000, while an average of 20 million people across Iran tune in to watch the game on television. So big is the pressure on the players and managers that not losing has become more important than winning, and the last four derbies have ended in goalless draws. In fact, the last goal to be scored in the derby was in 2012, by an Irishman. Eamon Zayed, a Dublin-born striker who was on the books of Leicester City as a teenager, scored an 11-minute hat-trick as Persepolis fought back from 2-0 down to beat Esteghlal 3-2. He was the first foreigner to score three goals in the derby and it made him a celebrity in Iran. "It was all Roy of the Rovers stuff because it was only my second game for the club," said Zayed, who is a Libya international. "The derby was front and back page news and I was asked on to their equivalent of The Late, Late Show we have in Ireland, where they count down to the new year. "I said a few words and wished the Iranian population a happy new year." The "Derby della Lanterna" ('Derby of the Lighthouse') pitches the oldest team in Italian football - Genoa, founded in 1893 - against one of the country's newest - Sampdoria, formed in a merger in 1946. Such is the rivalry that it seems both sides will go to great lengths to get any sort of edge over the other - even resorting to dressing in camouflage and spying on training. That is what happened last year, when Genoa youth team coach Luca De Pra was found hiding in bushes observing a training session held by Sampdoria. De Pra was suspended by his club, with Sampdoria releasing a tongue-in-cheek statement which read: "Like Rambo hidden among the branches on the hill, Luca De Pra failed to overcome Sampdoria's intelligence and counter-intelligence operations. "However, no prisoners were taken and no blood was shed. You should always forgive your enemies, as nothing annoys them more." The incident, though, highlighted how important the game is to the two sides. Former Chelsea striker Gianluca Vialli played in numerous derbies during his eight years at Sampdoria from 1984. "You need to fasten your seatbelt - it's a huge rivalry," Vialli told BBC World Service's Steve Crossman. "In the city, 50% of people are mad about Genoa, the other 50% are mad about Sampdoria. "You are in the stadium wearing your Sampdoria shirt and next to you is someone wearing a Genoa shirt and it could turn out they are your neighbour and nobody wants to fight with their neighbour." Losing Saturday's north London derby is unlikely to see any of Tottenham or Arsenal's players holed up on a boat on the Thames if they are on the losing side. However, a similar scenario once unfolded in India, when Mohun Bagan lost to East Bengal in the country's biggest derby. When the Calcutta side were beaten 5-0 by their city rivals in 1975, Bagan players escaped from angry fans humiliated by the defeat by spending the night of the match on a boat on the Ganges River. "If a team loses a derby then you are basically under curfew for a week, in that you are not getting out of your homes," former India team manager Eric Benny told BBC Sport. "But if you are the player who scores the winning goal, you are a hero. I know of instances when fans have asked players to baptise their new-born children after scoring in the game." The Calcutta derby is the only football match in India capable of challenging cricket for popularity. Traditionally a rivalry between the city's local inhabitants, who supported Mohun Bagan, and immigrants, who supported East Bengal, matches between the two have been fiercely contested for the past 89 years. They have regularly drawn crowds of 100,000 at the Salt Lake Stadium, with the highest being 131,000 in 1997 - still the record attendance for any sporting event in India. "It does not get bigger than this game," added Benny. "You would have whole families hopping on to lorries and travelling for four hours to watch the game. There would be over 100,000 people trying to get in. Some would sneak into the stadium without tickets. It means so much to the fans. "I knew a couple and the husband supported East Bengal, while the wife supported Mohun Bagan. After one particular derby, which East Bengal won, the wife would not see her husband after the game or even speak to him. "It can take fans of the losing team days to recover." It may not be as well known as derbies such as the Superclasico in Buenos Aires [Boca Juniors v River Plate] or even Flamengo v Fluminense ('Fla-Flu') in the same city, but Flamengo v Vasco da Garma in Rio is one of the biggest in the world. Having developed from an existing rivalry between rowing clubs of the same name, it is one of the oldest in Brazil and also one of the most followed in the country, with the two teams boasting an estimated 45 million fans between them - about 20% of the population. "Fla-Flu might be better known around the world, but the Rio derby that really gets the city going is Flamengo against Vasco da Gama, the so called 'classic of the multitudes' [Classico dos Milhoes]," says South American football expert Tim Vickery. "Introduced by the British, football in Brazil spread down from the elites and Vasco, club of the city's Portuguese immigrants, did more than anyone to give the process a push. "They won the Rio first division at the first attempt in 1923 with a team including black players and whites from poor backgrounds. Their success provoked a furious backlash from the traditional elite clubs, among them Flamengo. "But in the mid-1930s, seeing which way the political winds were blowing, a visionary Flamengo president signed the leading three black players of the day - among them centre-forward Leonidas, charismatic and controversial. "At a stroke an elite club had rebranded itself, acquiring the popular touch and stealing Vasco's thunder - provoking a rivalry which grows deeper with time."